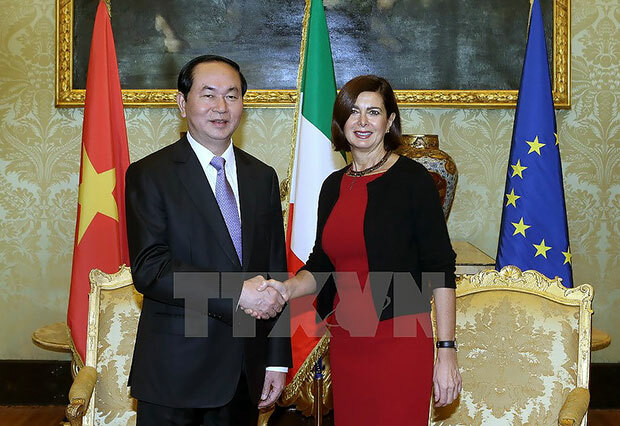 President Tran Dai Quang had separate meetings with leaders of the Italian Parliament – President of the Senate Pietro Grasso and Speaker of the Chamber of Deputies Laura Bonldrini, in Rome on November 22 (local time). The two Italian leaders welcomed the current visit to Italy by President Tran Dai Quang and affirmed Italy treasures and wants to deepen the strategic partnership with Vietnam, including cooperation between the two countries’ parliaments and people-to-people exchange. The two sides agreed that Vietnam and Italy need to enhance coordination in politics, economics, culture, education-training, science-technology, and defence-security as there are huge potential for bilateral cooperation. They discussed international issues in each region, affirming the necessity to increase cooperation at multilateral forums like the United Nations, Asia-Europe Meeting (ASEM), as well as at Inter-Parliamentary Union forums, Asia-Europe Parliamentary Partnership (ASEP) conference. The Italian parliament is ready to support the Vietnamese National Assembly to improve operation skills and provide technical assistance as well as share experience in law making, supervising and raising female deputies’ role, the Italian parliamentary leaders said. They spoke highly of the role and contributions of the 5,000 Vietnamese community to the local economy and culture. President Quang expressed his pleasure at strong development in the bilateral ties since the two countries established the strategic partnership in January 2013. Italy is Vietnam’s big trade partner in the EU. The two-way trade has increased every year, reaching 4.3 billion USD in 2015. The two countries target 6 billion USD for the 2017-18 period. He thanked the Chamber of Deputies for its ratification of the Vietnam-EU Partnership and Cooperation Agreement (PCA) in March 2016. He asked the Italian parliament to support and ratify the Vietnam-EU Free Trade Agreement in the time ahead, while encouraging Italian businesses to do business in Vietnam. Vietnam is willing to create favourable conditions for operations of Italian firms in the Southeast Asian nation. President Quang conveyed invitations of the NA Chairwoman Nguyen Thi Kim Ngan to the two Italian parliamentary leaders to visit Vietnam. They accepted the invitation with pleasure./.